Hillsboro High School teammates Austin Goolsby, left, and Jeremy Hayton are pictured at the Charlie Thomas Invitational at Texas A&M University. 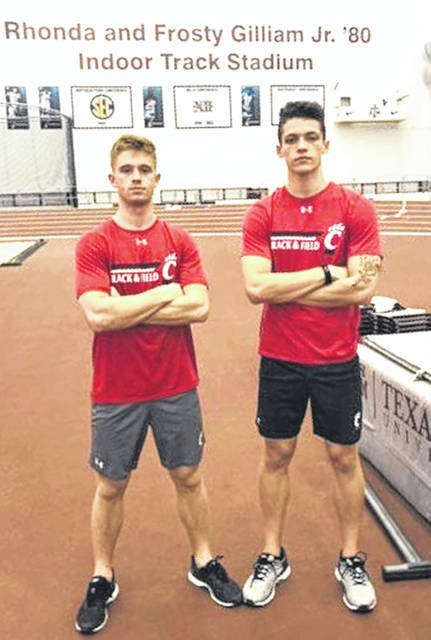 Following in the steps of recent Hillsboro High School Hall of Fame inductee Jarrod Hart, a pair of recent Hillsboro High School graduates are having successful in their first seasons as members of the University of Cincinnati track and field team. Hart completed a successful career at UC as a middle distance runner last year. Now Austin Goolsby and Jeremy Hayton are taking up where Hart left off, competing against teams from the Big Ten Conference, Southeastern Conference, Mid American Conference and schools like Texas A&M, Ohio State, Purdue, Indiana, Michigan, Michigan State, TCU, University of Kentucky, Ole Miss, Akron and Vanderbilt, just to name a few. They have competed in meets at Indiana University, the University of Kentucky, Texas A&M and last weekend at Vanderbilt. Goolsby, a high school state champion and two-time state runner-up in the pole vault while at Hillsboro H.S., cleared a personal best of 16’2.75 in the pole vault for UC last weekend at Vanderbilt, and is currently ranked sixth in the event in the American Athletic Conference. Hayton, a state indoor high jump champion who also took third in the state outdoors while at Hillsboro H.S., has a season best jump of 6’6.75 for UC and is currently ranked ninth in the event in the AAC. Goolsby and Hayton are competing Friday, Feb. 15 at Ohio State University at 4 p.m. at the French Fieldhouse in Columbus. The following week they will travel to Alabama Birmingham for the AAC Indoor Championships. They will have a short break before the outdoor season opens with the University of Texas Relays on March 29. * Hoosier Open at Indiana University — 15’11, 4th place out of 20 entrants. * Jim Green Invitational at University of Kentucky — 15’10, 10th out of 24. * Gladstein Invitational at Indiana University — 16’0.75, 2nd out of 10. * Charlie Thomas Invitational at Texas A&M University — 15’6.25, 13th out of 24. * Music City Challenge at Vanderbilt University — 16’2.74, 10th out of 24. * Jim Greene Invitational at University of Kentucky — 6’5.5, 9th out of 24. * Charlie Thomas Invitational at Texas A&M University — 6’6.75, 10th out of 24. * Music City Challenge at Vanderbilt University — 6’5.5, 9th out of 24. For a schedule and results visit the University of Cincinnati website.